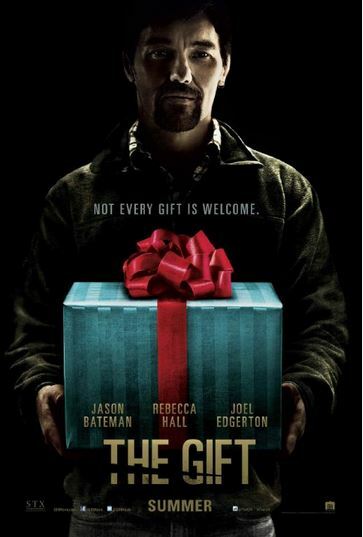 The Gift is the kind of film that reminds you that a good story is everything. The new thriller from Joel Edgerton, who also wrote, directed, and stars in the film, creates tension in such a quiet and unassuming way that the final revelation creeps up and takes you completely by surprise. The Gift offers up everything you already know about thrillers and turns them around in such a way that you’re always in the dark about where it’s going to go next. That’s what makes this quiet little film one of the best thrillers to hit the big screen in a long time. Simon (Jason Bateman) and his wife Robin (Rebecca Hall) move into a new house in a swanky California suburb. Right off the bat we know things aren’t quite right; the couple repeatedly refers to getting a “fresh start” and we see baby stuff, but no baby. Also the house is full of huge glass windows, which is a literal and metaphorical symbol of their vulnerability. Bring in Simon’s weird old high school pal Gordo (Edgerton), whom Simon doesn’t seem to quite remember, and we’ve got a familiar recipe for a “fatal attraction” on our hands. Just to top things off Simon and Rebecca have a friendly family dog named Mr. Bojangles – and we all know what happens to animals in these movies. Twisting our expectations is what makes The Gift so much fun to watch. Those familiar tropes are thrown in, but they don’t play out the way we expect them to. Mr. Bojangles does go missing, but instead of Simon and Rebecca stumbling across his dead body at some point, he shows up at the door, tail wagging. Did Gordo steal the dog just to mess with them or did Mr. Bojangles simply wander off for a few days? We don’t know, which plays right into the ending of this film. Predictably things do get weird between the couple and Gordo, but as the reasons why unfold the film starts to become more and more unpredictable. Gordo is not the bad guy we expect him to be, nor is Simon the good guy. Those expectations are played out so carefully during the film with just little hints that you can’t judge a book by its cover. Simon does seem to be a bit of a jerk even early on, but does that make him a bad guy? Or is he supposed to be the good guy? Gordo is weird for sure, but does being weird make you bad? Does Simon deserve what’s happening to him? Those questions aren’t fully answered by the film, but they may be answered by the viewers own perceptions of each of the characters and how they indentify with them. Surely there will be those who walk out of the film thinking Simon got everything he deserved and others who will think Gordo did the very bad thing he insinuated, but didn’t actually say, he did. Personally I think he didn’t, but that’s just me.